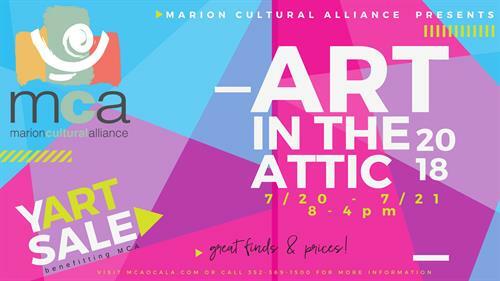 Back by popular demand, MCA will hold a “y-ART” sale – a creative spin on the traditional yard sale – Friday, July 20 and Saturday, July 21 at Brick City Center for the Arts, 23 SW Broadway, Ocala 8 am-4 pm. Marion Cultural Alliance’s y-ART Sale is a fundraising event that features previously enjoyed art at yard sale prices! Hundreds of works will be for sale including paintings, prints, drawings, photographs, and ALL will be sold at affordable prices! Early birds get the art treasures, Saturday’s “birds” get the deep discounts!